As a young medical resident, Dr. Robert H. Brown Jr. wrote an important piece of personal history in the Ether Dome, the famous surgical amphitheater at Massachusetts General Hospital. That was almost 40 year ago. In his mind’s eye, he can still see himself, a young guy in a white coat presenting a case of a patient suffering from amyotrophic lateral sclerosis, or Lou Gehrig’s disease. It’s what happened after he left the Ether Dome and entered an elevator that changed his career’s trajectory. Dr. Robert H. Brown Jr. is at the vanguard of ALS research, where he has become an internationally known and groundbreaking researcher. That catalytic moment helped launch Brown into the vanguard of ALS research, where he has become an internationally known and groundbreaking researcher. In 1993, he led a team at MGH that discovered the first gene linked to the inherited form of ALS. After 32 years at MGH, he has moved to UMass Medical School, where I found him this week still as charged up as that young man in the Ether Dome; still determined to find a treatment for a disease that has none, a scourge that each year terrorizes 5,000 new patients in the US who receive its death sentence. If you know someone with ALS, that confidence is nothing less than a beacon of hope in dark medical seas. When I was a kid, there was a judge in my hometown, a beloved figure who started the housing court in Worcester and worked to ensure that mentally ill people were not denied justice. His name was Morris Gould, and his son Chuck, now a Newton lawyer, was a friend of mine, and the youngest of Judge Gould’s six children. After the judge was diagnosed with ALS in 1973, Chuck invented a communication device the size of a large desk calculator that allowed his father to reach out to the family he loved. Rich Kennedy, another friend, believes that, too. His life depends on it. Kennedy’s father and brother died of ALS and through the years he and his family have been champions, raising money for research. He knows the disease and its symptoms as well as anybody. So he knew what it meant when his left leg went dead last March after he set out from his Cohasset home for a marathon training run. When I saw him on Friday, Rich Kennedy didn’t want to talk about himself or his diagnosis. Let’s talk about the doctor in my corner, he said. Brown believes a breakthrough is near. He doesn’t care about accolades. 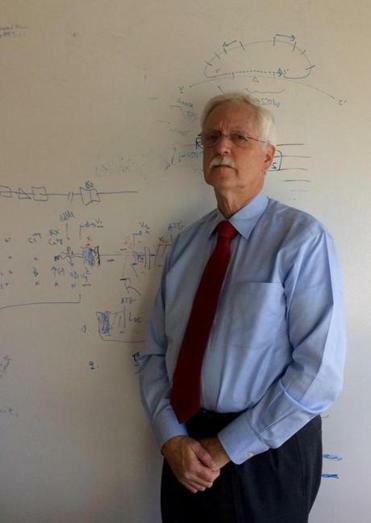 He knows he stands on the shoulder of medical giants like his old colleagues at MGH, Jim Gusella and Joseph Martin, men he called godfathers of gene-linkage research. And Bob Horvitz at MIT makes three. Dr. Brown is 69 years old now. He’s tall and fit and looks like he could run a country mile without breaking a sweat. But he’s looked mortality in the eye every day for decades and he has a mental image of what it’ll be like when he meets his maker. People like Chuck Gould and Rich Kennedy know the answer. What Bob Brown has done is to devote his career to smothering a cruel disease, working to consign it to the history books so generations from now when it’s mentioned at all, it will provoke this sweet question: ALS? What’s that?